Karen Bovenmyer (Popular Fiction, S’13) is proud to announce she’s co-editing (with Dagny Paul) Pseudopod‘s March ’18 Artemis Rising and they opened for submissions on September 1st! If you are a woman, non-binary, or female-identified, please submit your best horror stories 2k-6k. $.06 per word, original stories preferred, no multiple, no simultaneous. Open until September 30th. Veda Boyd Jones (Fiction, S’17) has sold a mini-mystery to Woman’s World (August 28, 2017 edition) and has a couple of articles in Harris Farmer’s Almanac 2018, now at newsstands. Publication of Bruce Pratt‘s (Fiction, S’04) short story collection The Trash Detail has been set by New Rivers Press for Fall 2018. 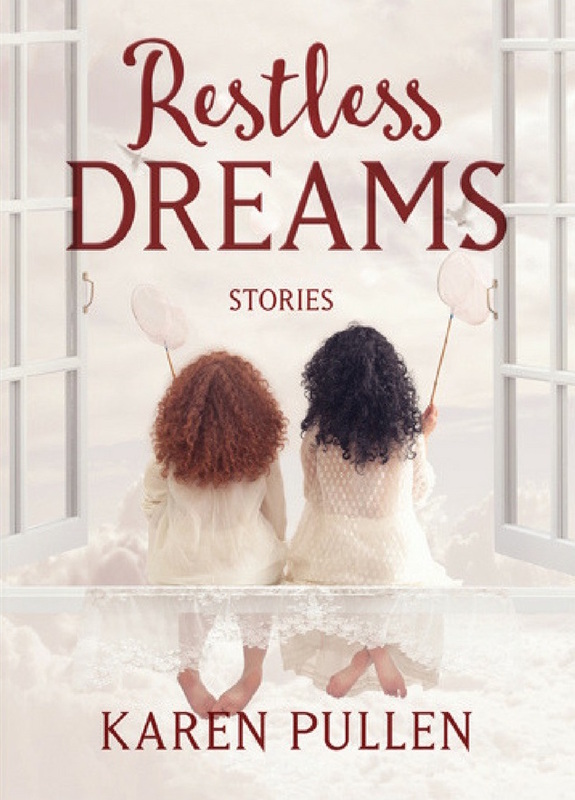 Karen Pullen (Popular Fiction, S’08) is pleased that her story collection, Restless Dreams, will be published on September 1 by Gus Gus Press, an imprint of Bedazzled Ink. Many of the nineteen stories were introduced and fine-tuned in Stonecoast workshops. Lisa Romeo (Creative Nonfiction, S’08) is pleased to announce the new, official title for her memoir, due​ May 2018 from University of Nevada Press—Starting with Goodbye: A Daughter’s Memoir of Love after Loss. Lisa taught this summer in The Writers Circle Teen Intensive at Drew University in New Jersey, and published an interview with Sonya Huber at Cleaver Magazine about Huber’s new essay collection, Pain Woman Takes Your Keys (University of Nebraska Press). Tamie Parker Song, formerly Tamie Harkins (Creative Nonfiction, S’12), won a fellowship at MacDowell Arts Colony! She will be there this year, September 29-October 20. Having been freed from the shackles of working in academia, Olive L. Sullivan (Fiction/Poetry, S’15) has had a burst of creative success. Three poems and the short story “O Bonnie” will appear in the 2017 issue of Konza, a bioregional journal on living in place from the Kansas Watershed Council. Her poetry collection, Wandering Bone, is forthcoming from Meadowlark Press, with an anticipated release date of December. Many of the poems in this volume were written during Sullivan’s term at Stonecoast under the tutelage of Jeanne Marie Beaumont. Jim Kelly’s (Popular Fiction) ten-minute play Grouped will have its premier at the Paragon Science Fiction Play Festival in Chicago in November. This will be the second year in a row Jim’s work had been featured at the Paragon Festival. At the KGB Bar in New York City, Jim will be reading “Yukui!” a new story from his forthcoming collection The Promise Of Space as part of the Fantastic Fiction Series on October 18. Recently, Jim was profiled by Wired. Jim has also announced the relaunch of his personal magazine Strangeways, which will be issued quarterly as an email attachment. It will feature essays on craft and popular culture, exclusive original audio narrated by Jim, including his own stories and some favorites in the public domain, reviews of recent fiction and non-fiction and chances to win a what Jim is calling Flash 250s. “The idea here,” he says, “is that you send me the first 250 words of a work in progress and I will send you back a flash (ie. short) critique of your opening.” Strangeways will be free to anyone signing up on Jim’s website. 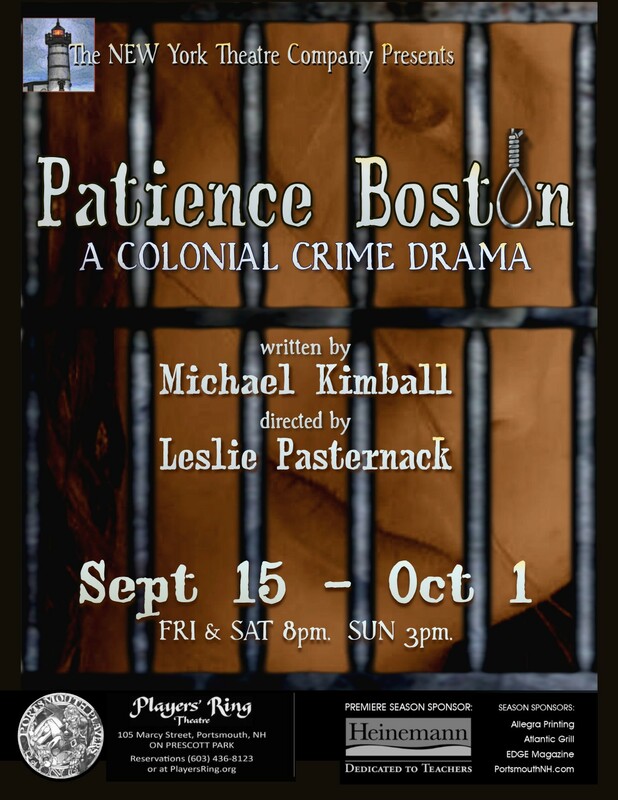 From September 15-October 1, Michael Kimball’s (Popular Fiction, Scriptwriting) colonial crime drama Patience Boston will be staged at The Players Ring Theater, 105 Marcy St, Portsmouth, NH. Show times are 8:00 p.m. Fridays and Saturdays and 3:00 p.m. on Sundays. Tickets cost $18, with discounts for students, seniors, and Players’ Ring members. To reserve, visit www.playersring.org or call 603-436-8123.